Animals are dangerous, especially wild animals. You do not want to mess with them. This, however, is not a wild animal. 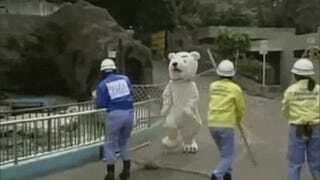 Today, at the Ueno Zoo in Tokyo, an animal escape drill was held. 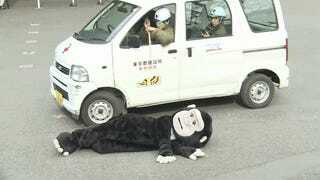 As Twitter users in Japan were quick to point out: The escaped gorilla does not look like a gorilla! 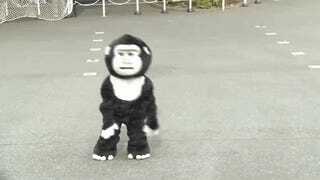 It doesn't walk like a gorilla. It's not scary or mean-looking. This is like they were doing a drill for an escaped stuff animal. Then, they are pretend shot with an pretend tranquilizer, rendering them pretend unconscious. And then, they poke the animal with a stick, put it in a flatbed, and haul it off. 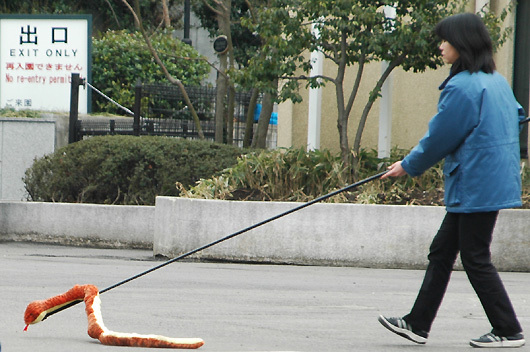 For years now, zoos in Japan have used drills like this for practice—and publicity. The drills get short segments on television and are covered online. People attend these drills and snap photos as well as take videos. In some videos, you can hear people giggling. There are also similar drills outside Japan. 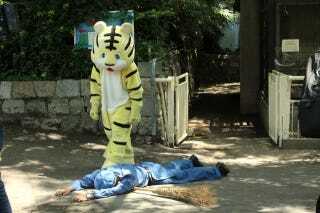 Here's a drill at a Chinese zoo for when Tigger escaped. 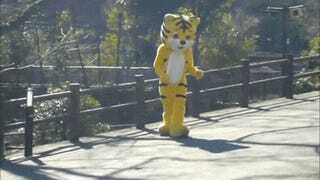 In Japan, the faux animals can look real-ish. Take this zebra. It doesn't look so bad. Never mind the human legs. Or the awkward turning radius. They don't usually walk like animals. And their attacks are kinda lame. WOAH. But not all of them. This was an escaped gorilla at a primate zoo. 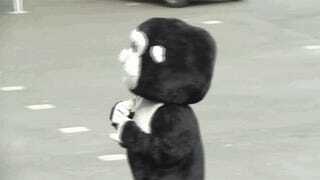 A freaky escaped gorilla. And that's not very cute at all.